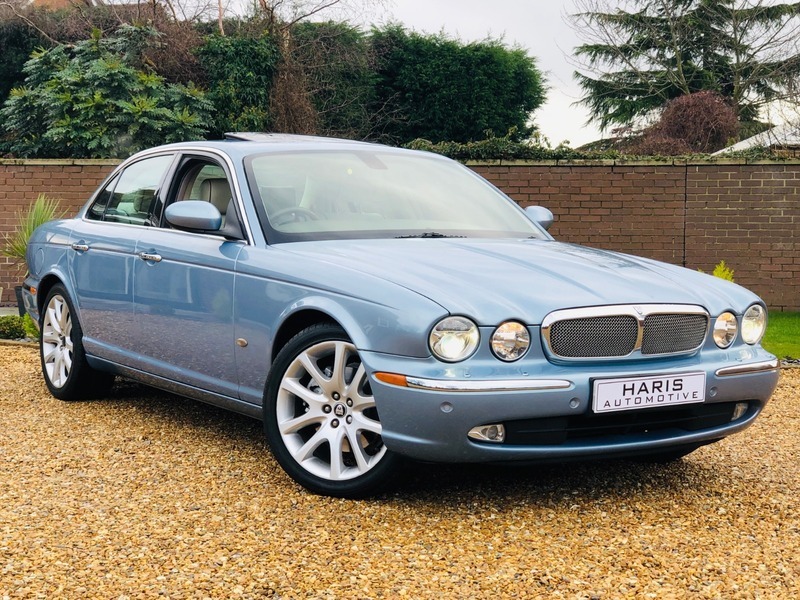 HERE AT HARIS AUTOMOTIVE WE ARE PLEASED TO OFFER THIS STUNNING PRESTIGIOUS 4.2 'SOVEREIGN' JAGUAR XJ WHICH HAS BEEN EXTREMELY WELL MAINTAINED WITH 14 SERVIVE STAMPS WITH 12 JAGUAR MAIN DEALER SERVICES + ALUMINIUM BODY + 2 KEYS + MOT UNTIL JANUARY 2020 + PRESENTED IN A STUNNING COLOUR COMBINATION OF 'FROST BLUE' WITH LIGHT IVORY HEATED ELECTRIC LEATHER COMFORT SEATS + REAR HEATED SEATS + ELECTRIC MEMORY DRIVER SEAT + TILT/SLIDE ELECTRIC SUNROOF + AUTOMATIC + XENON HEADLIGHTS WITH AUTO HEADLIGHTS + TWIN EXHAUST + PARKING SENSORS + 19" ALLOY WHEELS + SATELLITE NAVIGATION + CRUISE CONTROL + CD CHANGER + PART LEATHER & WOOD LUXURY MULTI FUNCTIONAL STEERING WHEEL WITH AN ELECTRIC ADJUSTABLE STEERING COLUMN + ALPINE SPEAKER SYSTEM + DUAL DIGITAL CLIMATE CONTROL + AIR CONDITIONING + FRONT AND REAR ELECTRIC WINDOWS + ELECTRIC POWER FOLDING MIRRORS + VALET MODE + DRIVER CENTRE LEATHER ARMREST + REMOTE CENTRAL LOCKING + BEAUTIFUL EXAMPLE WHAT A STUNNING PRESTIGIOUS CAR THIS IS THE ONE TO HAVE !! Audi A8 TDI QUATTRO SE EXECUTIVE + MASSIVE SPEC! !